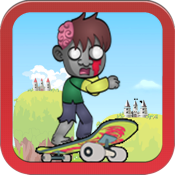 Your zombie surfer skates through the air collecting the thing he craves: brainzzzz. Dodge poison pods and pitfalls as he flies through the kingdom. Complete goals to become the Zombie Surfer King. Endless gameplay!